Bike racing. Tuesday. France. GNB Sports. Welcome to Stage 3. Following yesterday's massive crash just before the finish, 187 riders started this morning. Thomas Vaitkus of Discovery Channel was forced to abandon following surgery last night to fix five unstable fractures of his right thumb and install a plate. Other riders are on the road this morning showing the insanity -- or at least, physical courage -- of these riders, riding with everything from multiple concussion to lacerations to stitches. Ride or abandon, and everyone who can, rides. During the day, medical decisions are made by a Tour physician. Fall and need bandaging? An official car will assist you, not your team car. The nice thing of course about chatting with the Tour doctor is, you hold on to the doctor's car and get a free tow. That's one of the reasons it's the Tour doctor giving you care, and not your own team. Your team on a normal day has two or three cars on the road, both with multiple spare wheels and bicycles strapped to the roof for quick swaps. These cars trail behind the peloton or breakaway to be available if needed, driving in the order of the General Classification. Of course during a time trial, your team will have cars behind each rider, so with nine riders to a team, simply the budget for cars and drivers and vehicle mechanics is substantial, before one even gets to the bicycles and taking care of the riders with showers, chefs, acupuncture, massage, and so on. Today is the longest ride of the Tour with only one category-4 ascent, the Cote de Bierancourt, at the 202.5 km mark. Otherwise, while the countryside is beautiful, the ride is unremarkable. Long straight roads. These are the dog-days of the Tour, where nothing much happens and the sprinters rule. Thus two French riders no one has ever heard of before, Nicolas Vogondy (Agritubel) and Matthieu Ladagnous (FDJ), managed to breakaway just 6 km into the race, and currently, with 110 km to go, are up 7:50 min on the peloton as the peloton slows to enter the feed zone. While the peloton slows to eat, lets talk as promised, about going to the bathroom on a long ride. First, no one has time for anything but peeing. A rider's body is wired up tightly, not wanting to have a bowel movement, certainly not while racing. Their biology simply isn't designed to expend energy on the non-essentials during a race. Peeing, yes; crapping, no, short of an emergency. As for peeing, it is called, "taking a natural break." The riders look for a spot not packed with spectators, which isn't always possible and certainly won't stop them; when you have to go, you have to go. Ideally a number of riders pull over at once, pee quickly, then ride back to the peloton together. Riders riding together expend about 60% less energy than riders alone. All riders work together; no rider would take advantage of riders stopped by the side to try and gain a lead. And when the Tour leaders stop to do their business, television cuts to commercial and the entire tour slows down till the leaders catch back up. And that, darlings, is how one "takes a natural break." Trivia: How many teams in this years Tour are riding bicycles made by companies founded in North America? Answer: Six. Nothing much to say about today's race. The riders ride. The breakaway is out front. It's all very boring. Six and a half hours. There's no reason for the breakaway except the glory of the individual riders (and France. Let us not forget the glory of France.) And for their individual teams of course. Their sponsors will be running advertising all year based on this one breakaway. Seriously. But for us? Boring. The break is only 4:45 minutes ahead, with 100 km to go. Let's talk about the sprint finish today. Cobblestones. There's a sharp turn about half a klick before, narrow streets before the 1 km kite (a huge bright red triangle hanging down under which the entire race passes, which indicates 1 km to go), and worst of all, the entire run up to the finish is on enormous cobblestones. These are huge stones with big spaces between them, lots of room for a bicycle to slip and go down. And the Gods help all riders if the cobblestones get wet. Weather has threatened all day, but hasn't happened yet. Again: narrow streets, sharp turn, huge cobblestones, and if the stones are wet, total disaster. That's todays' sprint finish in Compiegne. Compiegne is where the Armistice was signed that formally ended World War I. Incidentally, the Tour has only finished here once before, in 1980 when Stage 6 from Lille went to Frenchman Jean-Louis Gauthier after sneaking ahead of a five-man break, winning just 39 seconds ahead of the peloton. Sometimes the break does succeed. But not today. The peloton is screwing with the breakaway. The break is tired, knows they can't possibly survive, and frankly, would like to come back to the pack. But every time the break slows down, the peloton slows even more, leaving the break all alone and suffering. Silly rabbits. All you have to do is sit up and wait for the peloton. What? Your sponsors would rip your shirts off your skinny shoulders and drag you under the team car, not to mention the glory of France for disgracing your sponsored brands? Ride or die. "Well, here's another nice mess you've gotten me into." It isn't just us. The television commentators are also talking about how boring todays' ride is. They're simply more polite. We don't do polite at GNB Sports except when meeting your mother. The riders are roughly one hour behind where they were expected to be right now. Why? Because they're riding so damn slow. Hurry up riders, hurry up. Drug controls were conducted this morning on 53 riders from six teams: Astana, Predictor-Lotto, Francaise des Jeux, AG2R, Discovery Channel, and T-Mobile all receiving visits from the Union Cycliste Internationale (UCI) medical team. We'll speak more of the doping situation including the case of Floyd Landis, in a future post. Probably on the first rest day. Riders' bodies are tired today, but not yet numb. The pain of a long multi-day race is setting in for real. By tomorrow, the fourth full day in the saddle, the pain will have settled in to every part of their bodies, but the numbness will have moved up to deaden the pain as well. This is why we don't think anyone is too upset about the field cycling at only a little over 20 mph today. They're simply taking it easy. Two riders just jumped off the front, one of whom is Stephan Auge (COF), who is tied with David Millar in the King of the Mountains category. This is going to be a real problem for David Millar with his King of the Mountains jersey, and the category-4 climb coming up. Auge and Willems (LIQ) are trying to bridge the gap to the lead break which is only 4:15 ahead of the peloton. The peloton isn't reacting at all. Hmm. After a little while, the chase has closed to within 1 minute of the break, so they're really making good time and should catch the break quickly. Once they catch up, the breakaway with four men working suddenly becomes more interesting and dangerous as four men can stay out longer and with less effort. Short version: Harder for the peloton to chase down four men. Although they still have to, but suddenly not a sure deal. Yes, that's precisely what is happening. The Team Leader for the breakaway has just told the breakaway two riders to wait for the chase two riders, as four riders working together somehow might be able to hold off the sprinters all the way to the finish. The break held up just a bit, and now the chasing two are joining up with fresh legs having been sheltered in the peloton all day. All four are together now in the lead and wow, they're accelerating away with 52 km to go, 3 min over the field. Stephan Auge absolutely needs to stay clear at least till they clear over today's one major climb. If he does, he'll wear polka-dots (the King of the Mountains jersey) on the podium this evening. This four-person breakaway completely changes the nature of the race. Millar's only hope of hanging onto the King of the Mountains jersey is if Auge goes over the top of the climb in fourth position, as climbing points are awarded only to the first three riders. CSC is trying to drive the peloton forward, but it isn't working and clearly the break will make it over the climb first. The question is, will it be David Millar (CSC) or Stephan Auge (COF) in polka-dots tonight? Congratulations to Stephan Auge, over the Cote de Bierancourt first and awarded three points, King of the Mountains leader after Stage 3. A gutsy tactical move which paid off and his first ever Tour jersey. David Millar remains second. The peloton remains 3:23 minutes behind. The peloton has realized they may have made a mistake by letting the breakaway get stronger and is organizing to chase them down. All the sprinters are putting men out front, but the four men in the break look very strong. The outcome is uncertain with 27 km to go. The real danger zone for a crash is anything before 3 km. UCI rules say all crashes in the last 3 km are given the same time as the riders in their group at the time of the crash. But if the crash happens at 3.5 km and you get stuck behind it, you could lose enough time to lose the Tour. The favorites will be riding fast, surrounded by their teams, trying not to get caught up in another melee. Then the train really starts to haul with the lead out men trying to position the sprinters so they're positioned perfectly at the 1 km mark, for a dead sprint, launching the sprinters on their own for the last 200 meters to international glory. The breakaway is going full out, holding nothing back. They don't dare think yet of individual tactical advantage with the peloton trying to catch them. If they blink, the peloton will overrun them, now only 1:51 behind with 14.5 km to go, traveling at 53 km per hour and accelerating all the time. The break still has a chance if they stay focused, but my bet is, the get caught almost in sight of the finish. The breakaway is hurting. They've got 1:15 on the field, with 7 km to go. Quickstep is throwing everything they've got in the chase, and almost everyone has someone on the front trying to bring these four renegades down, and still they race on. They race referees are starting to move the cars out of the gap between the peloton and the break. With 5 km to go, just 45 seconds up, the peloton going over 55 km per hour and around the round-a-bouts and flowing back together, hanging in at speed and now 4 km, 32 seconds, the break hauling with all they have and at this rate everyone's going to come across the line together. Two riders of the break are out front by themselves, no, the other two are clawing their way back, all four are back together and the peloton is still 24 seconds back and they won't make it. Just 2 km to go and they won't make it. Check that; the breakaway is going to make it if they just ride fast enough. Now only 1 km to go and there's the red kite overhead. Here come the cobblestones and the nasty corners and it's a total toss-up, the peloton right on the break, the long straight to the finish line and DOWN THE STRETCH THEY COME, everyone fighting and the Yellow Jersey himself somehow has pushed through everyone, is fighting for the lead and is catching the lead. The Yellow Jersey has caught the lead and is out in front. Here comes Robbie and Zabel, but Cancellara, Cancellara, Cancellara WINS THE STAGE! Cancellara, the World Time Trial Champion and holder of the Yellow Jersey rides straight off the front of the peloton, right over the breakaway, rides all the sprinters off his back wheel, grabs the 20 second time bonus and shows everyone who is boss. 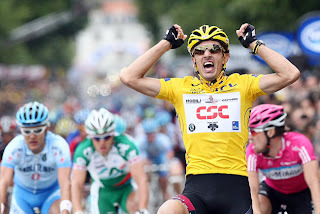 No doubt who won today, it was Fabian Cancellara. Stage Four is viewable LIVE in the United States on Versus, Wednesday, July 11, 8:30 - 11:30 AM ET/5:30 - 8:30 AM PT.